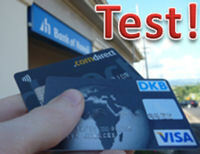 How to withdraw cash in the USA with German bank cards? “Withdraw cash for free worldwide” – the DKB promotes itself with this slogan. It deliberately omits to use an asterisk sub-point, which could indicate that local fees may apply depending on the ATM. Which top Visa credit card will win the cash test? However, this happens occasionally abroad, for example, regularly in the United States and Thailand. The DKB has no influence on this charging. The ATM charge is refunded by both! This refund, however, is made at the request of the customer, so that the promise of providing free cash withdrawals is valid. This fact is already known to a wide range of customers of the DKB and is used frequently. It is little known that the Comdirect does the same. Although I am a Comdirect customer myself since many years, I have found out this by accident in autumn 2013 and have the intention to make a test for my readers during my next trip to the USA. US$ 60 were withdrawn using both Visa credit cards. On January 5, 2014 I withdrew in Lihue, the capital of the Hawaiian island of Kauai, US$ 60 one after the other with both, the Comdirect as well as with the DKB VISA credit card. In both withdrawals, an ATM fee of US$ 2.75 was charged. EUR 2.10 EUR 2.03 Please not the Reference of the Difference. Evaluation of the test result! In this true test, the Comdirect won with EUR 0.03 advantage! However, the reason lies in the fact that the DKB has allowed more time for refunding the ATM fee. The refunding does not take place at the exchange rate of the withdrawal, but at the current exchange rate on the date of refunding. The exchange rate worsened between the cash withdrawal and refunding date. On top of that, there is the fact that US$ 60 was only a small withdrawal amount for this test. In order to keep the refund cost as low as possible, one should rather withdraw US$ 600 at once from the ATM. Since the Comdirect – as in the first US cash test in September (article in German language) – had a slightly worse exchange rate, one would have an advantage using the DKB. Extrapolated to US$ 600 plus US$ 2.75 fee with the true data from the test, the Comdirect would charge EUR 440.81 (EUR 442.91 minus EUR 2.10 refund). The DKB, however, would only charge EUR 440.48 (EUR 442.51 minus EUR 2.03 refund). Difference: EUR 0.23. Comdirect and DKB are both ideal for cash withdrawals! would have been much more expensive, I declare both Comdirect and DKB VISA credit card for ideal German bank cards for an optimal cash supply abroad. The difference is in the low cent range. Sometimes, the Comdirect wins, sometimes the DKB wins, but both with a gigantic advantage to other bank cards. This is another confirmation that I selected the DKB and the Comdirect as the true top providers at DeutschesKonto.org. In contrast to the test in September, I did no submit the receipt evidence of the ATM fee, not at the Comdirect nor at the DKB. I simply wrote an e-mail about the cash withdrawals and asked for a refund. The reason for the faster refund of the Comdirect is the processing without prompting. At the DKB, there was a seemingly automated inquiry about the last 8 digits of the credit card number. This, however, could also have been determined by the employee, as I had indicated my main account number in both cases. These are the very best German bank cards for cash withdrawals on journeys. Finally, I would like to say “THANK YOU” to both banks. They both offer an exceptional customer friendly current account with a free VISA credit card and, as seen in the test, an ideal possibility of true free cash withdrawal in foreign countries too. You both have my respect and appreciation! You have a brilliant website here! I’ve been a DKB customer for about three years, and could not be happier – it really is a straightforward and perfect bank! Thank you for your comment. We wish you continued joy with your DKB account! The comdirect don’t refund the fee abroad anymore since 15.2.2016 that’s crap. I can’t find any atm in Thailand there are not charging a fee. So, withdrawing cash with Visa card from comdirect will always be charged? Doesn’t it say in their website to be free withdrawing outside EU by visa card? I am confused now.